I'm trying really hard to understand scheduling a post on blogger. I failed with my purple day post (it came out prematurely) so I'm re-trying at the risk of spamming my twitterfeed with this one. Feast your eyes on these little beauties while I try out another scheduled post. March 26th is Purple Day! On March 26th the Canadian Epilepsy Alliance is launching their second annual Purple Day to raise awareness of epilepsy in support of children, their families and adults affected by the disorder. With the cooperation from epilepsy organizations around the world, it has become a global initiative. You cannot tell that someone has epilepsy just by looking at them; they're not taller, shorter, clumsier or walk with a stick. This means that many people with epilepsy can quietly go about their everyday life leaving those who they meet none the wiser about their condition. And many choose to do this since epilepsy still carries quite a stigma in society. There is a lot of misinformation, ranging from incorrect first aid advice (please do read the First Aid tips linked below - it will help both you and your patient avoid injury) thru full blown prejudice about mental impairment to active discrimination in employment, the legal system, parenting and education. But sometimes you can spot epilepsy. A dreamy child might be going thru a petit mal seizure so inattention in class is involuntary, not willful. An apparently intoxicated co-worker might be struggling with a new anti-seizure regime. Resisting physical confinement may not be aggressive; it could be the manifestation of a certain type of seizure and so on. ...... or maybe even just choose a different figure of speech to describe someone’s behaviour on March 26th. Spring must be around the corner. 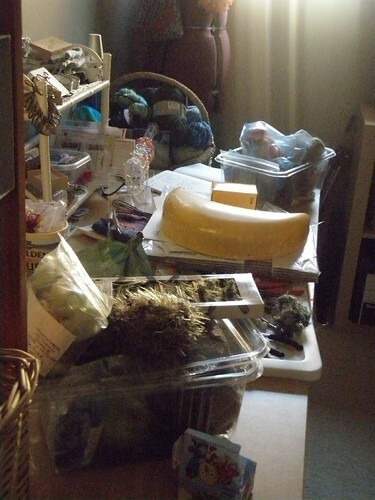 I suspect this not because the sun is peeking out from behind the many clouds but my studio got an impromptu clear out last week after I ranted at how messy my desk was. So this morning (my child-free morning!) I'm starting things off with freshly brewed coffee, some new fuzzy balls to play with (not mr ebb btw, who is the only 'cloud' in my day since he's working from home!) and a blog post about how efficient I'm going to be today (ho hum - catch me on Twitter to see how I'm doing thru out the day). First off is this blog post (ta da!) 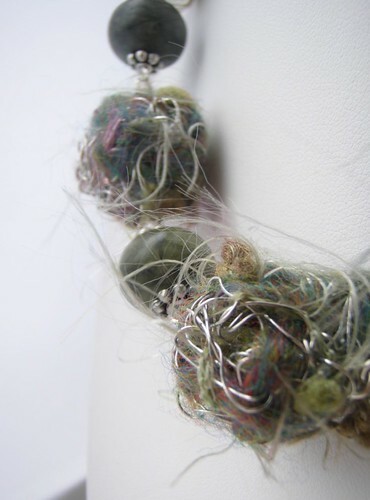 and then I'm going to pair the fuzzy balls with some beautiful fluorite beads and silver spacers to make another choker (I really like this length though I will lengthen on request!). After that I have piles ofr admin to do. Sometimes it's just not possible to portably craft 24/7 as the desk time catches up. In a burst of spring efficiency I have cleaned my desk and tidied my studio (but not too much). Spring Break is over so my blissful 2 and a bit hours of child-free-ness has resumed. In translation I can now play catch up so excuse me if I'm not blogging v much - there are a million and one things with deadlines which I need to elminate. ... but I did get this choker finished, photographed and photoshopped to be ready for listing. Now I just need to list it ..... not sure where yet. Oh, and I might get round to making some of the fuzzy balls as beading supplies .... when I get used to having some time to myself again! PS: there are some naked balls here! By jiminy - yes (if today's sun is any indication). Around this time of year I get so sick of winter that I start yearning for spring and the little green shoots. A couple of years ago this yearning was so extreme that it spilled over into my crafting. 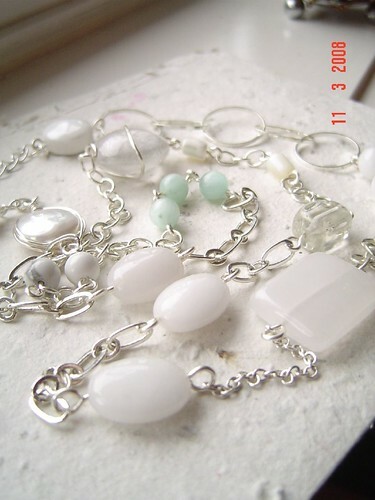 I made a long necklace which incorporated three tiny green (amazonite I think) beads among so many white ones. This year I have another long necklace featuring some wire beads ready to be photographed and listed (ah for some time!). I've also made a few fine silver IISY cuffs, there's one on icraft, with tiny green beads nestled among the silver mesh and white beads. 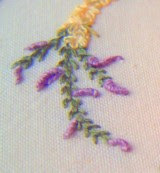 Must make some more - they would be great mother's day gifts! I'm not that great with spring break. My desk has become a sort of dumping ground. I really hate the way that being short of personal time robs me of any sort of routine or plan or efficiency. When I have no idea how long an amusement might keep The Wee Guy occupied I find it very difficult to settle into any kind of project - I hate being torn away from something when I'm fully into the moment of it, indeed I have even been known to bite heads off at the slightest interruption. What I should have done is pre-empted the time scarcity of Spring Break and organised a few projects to make the most of varying lengths of time. I have in fact had a whopping 2 hours each afternoon while clay class was in full swing, but since all I could do was sit internetting in Starbucks I must admit that I squandered the time somewhat. I did get some www searches sorted (my Renaissance Wax should arrive soon and I've found a number of piano books on ebay!) 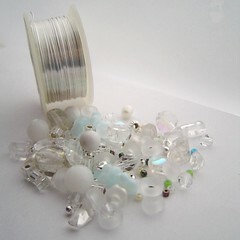 and sourced a cheaper supply of contact lenses, but otherwise my crafty fingers are twitching. I hate not being productive. For me, life is too short to be unproductive. 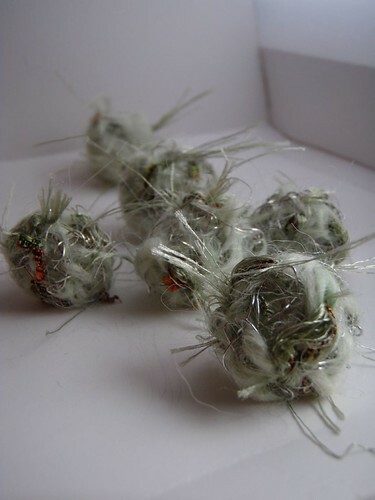 I have a craft fair coming up, my sister arrives at easter and a new supply of fuzzy balls need to be strung. If I had been wise, I could have made some more wire beads in spare 10 minute slots or finished a few more rows of crochet on a ribbon scarf. 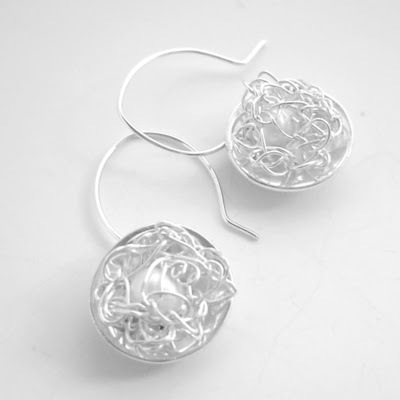 I could have sorted a bead soup or strung them on wire for some new cuffs in 20 minutes and with a luxurious 30 minutes finished some trickier bits of shaping on a knit pattern. .... but I didn't because at the back of my mind the tax deadline for online filing is looming and my desk is too messy to work at! Although i am a firm believer in a clean desk representing an empty mind i think the current state of chaos is taking it just too far. another impromptu birthday cake, originally uploaded by ebbandflo_pomomama. dear reader ........ i married him! oops! no, that's the end of another literary work of genius. 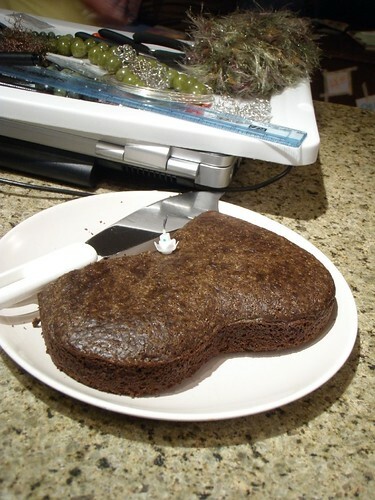 this is the start of a recipe of great convenience - chocolate buttock cake. OK it was a heart shape but we started before I could photograph the finished item. Mix together all the dry ingredients until well combined. Mix together all the wet ingredients until well combined. Mix together everything until well combined. Pour into a well-greased 8-inch square baking pan. Bake at 350F (180C) for 35-40 minutes until skewer inserted into middle of cake comes out clean. Cool on rack for 15 minutes before slicing. Good with cream, sour cream or yogurt, warm or cold. As with most mums or stay-at-home parents who aren't quite in the same "league" as the alleged Etsy QYDJ featured sellers (tho' am not sure how most of us manage to miss that set of criteria since none of the SAHMs featured have actually quit their day jobs)(oh yes - don't get muted for a start I guess!) running an at-home craft business involves a lot of time-juggling and parental balancing acts. It is truly a work of art in itself. For example, I'm clicking away on the old keyboard at my local Starbucks with my mega-mug of coffee and their wi-fi hotspot while my son attends a Spring Break clay class at the nearby Art Centre. He needs entertainment - I need to get on with marketing (which is what I'm doing right now - go buy my stuff! ), photoshopping new business cards and making new inventory for an upcoming craft fair. Unless I fit all this necessary admin in and around my daily life I either end up with nothing or it all happens in the wee small hours of racoonmumhood. I feel pretty smug about my portable crafting abilities now after a few years of practice but the marketing, admin, etc stuff is still lagging. I'm kidding myself somewhat into thinking that it will all take off once full time school (ah that holy grail!) happens in September. In reality I need to get a grip pretty darn soon. So far I blog and do a bit of social networking. My Google Analytics and other tracking shows that my Twitter hits are effective in getting peeps to my shops. The Got Craft and Portobello West craft fair websites are also vg at sending visitors so hopefully adding the ArtFire Rapid Cart to my homepage will eventually result in some direct sales. Otherwise, I'm not that fond of Ning, I'm getting used toFacebook (had a lovely chat yesterday afternoon with a couple of old high school friends I haven't seen in over 20 years) but I am falling totally in love with ByHand. I use the blog feature for a bit of shameless promotion. It drove a lot of lookers to a flickr photo I used and certainly seems to have potential for marketing at least the crafty supplies side of business. But now I'm even more in love with the site. This morning when I filled in my sporadic blog post and hit "send (or whatever)" I was then asked if I wanted to post it to my blogger?? Wwwwwwwhaaaaaaat? Oh yes! No more blogging on three different blogs? I posted a piece on yarn bombing then sent it over to my portable crafting blog for good measure. ByHand - you've made my life easier. I think I love you. yarn bombers!, originally uploaded by ebbandflo_pomomama. I saw my first act of yarn bombing this weekend while on retreat on Salt Spring island. 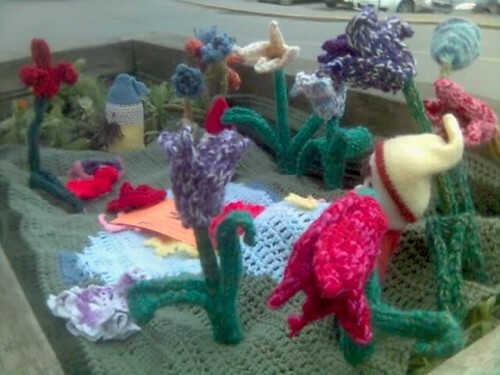 The yarn bombers had colourfully and tastefully transformed a planter outside the local grocery store into spring garden of knitted tulips and gnomes complete with their own verdant patch of grass. A nearby tree was decorated too and a small notice informed onlookers of the yarn bombers' intention. Everybody I saw who passed and stopped was smiling at the sight. ... and then the next morning the installation was blanketed in fresh snow with just the tips peeking out. I'm not sure about the Gulf Islands since I'm not a resident but sometimes winter just drags on and gloomily on in Lower Mainland BC so a cheerful reminder that spring is not far off is a welcome break. 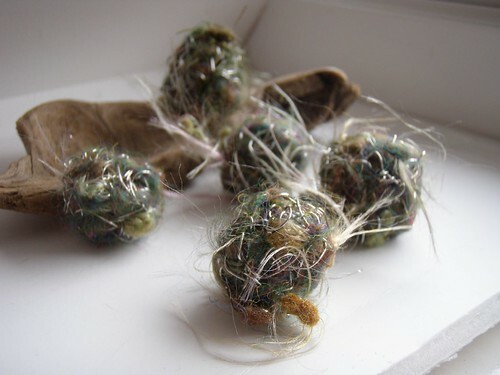 mossy fuzzy balls, originally uploaded by ebbandflo_pomomama. wonder how many hits this photo will get in my flickr stream? tagging anything with fuzzy balls seems to incite curiosity. 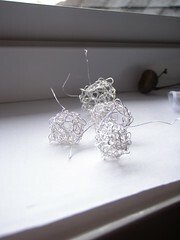 anyways - i made some more wire beads using Beazu's new Smart Wire (never again - it's cheap but not that great to handle. 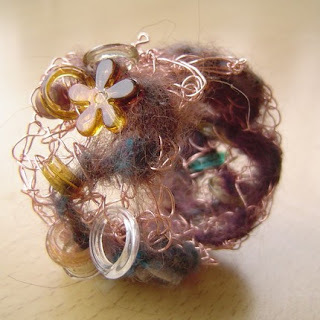 i suspect it contains v little copper core which makes it not as good to work with as Artistic Wire). this little batch is fresh out of the felter in all their fuzzy goodness. i have some cute green jade rondelles to pair them with in a choker-length necklace. ...... did i mention that i'll be at Got Craft on May 3rd? 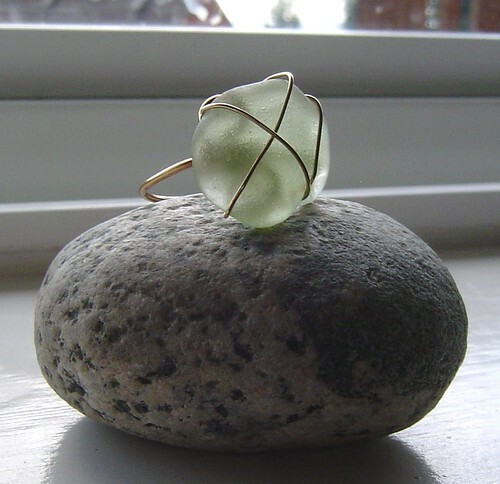 seafoam wire ring, originally uploaded by ebbandflo_pomomama. thank you very much for a pleasant evening out with one of the most helpful waitresses ever (she was a real star). however, please have a word with your chef - tell him simply that adding excessive salt to food, to every food item on my plate, does not increase it's attractiveness to my palate. in the same way that curry spices mask the flavour, too much salt takes away the will to live from my taste buds. it's not the height of culinary skill to able to oversalt every dish until it burns the oral mucosa. then it's not so much fine dining, but an endurance course. one day i would like to taste what i am eating when dining out. PS: ditto on the too much pepper just in case s/he is wondering how to jazz up the mains in future. My 'helping hand' for this Friday (or for those in the UK ....). Yes, I was tagged - by Crystal of kizzdesigns so I now have to ramble on about some random ramblings about me. Baking is a stress-buster for me. I enjoy big batch cooking and then storing away the provisions in the freezer for more time-starved moments. My dog, Toby (see above), was left for me to euthanase one night at work. No one could give me a solid reason why such a sweet-tempered dog should warrant the death sentence except that his owners had got tired of him. I took him home. 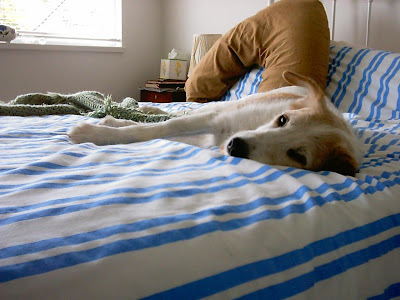 He lived with me for almost 15 years, and even emigrated to Canada with me. Sadly he was eventually put to sleep at the ripe old age of 15 due to failing health. I still miss him and his friend, Mauz, a lot. I used to be able to dance en pointe. I was a goth once upon a time. OK - the rules say that I have to tag another six people but I'm sure my online friends will breathe a hearty sigh of relief if I just let it lie here! Check this out! I've added the Artfire Rapid Cart to my googlepages website, pomomamadesign dot com. Dead easy! ... V impressive! Although Googlepages has a few glitches (and has been superseded by the updated Sites) I've been quite happy with it. (My only whinge is that placing images is 'tricky'.) I also use it to compose newsletters which can then be pasted into email, complete with a "view on the web" link. 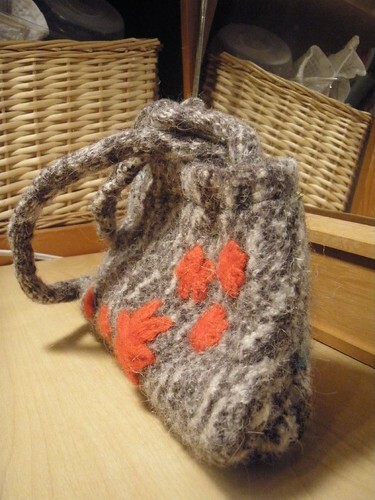 felted and upcycled alpaca purse, originally uploaded by ebbandflo_pomomama. NB: it's not the ugliest purse I have ever produced (that one will not see the light of day without severe modification) but it possibly the hairiest. The body is constructed from machine knit swatches of alpaca which were then felted into shape. As a side note, do alpacas live in a rainy climate? If they do, how do they stop themselves from felting solid or are old alpacas recognised by their complete immobility? The handles are also from the same felted swatches in roughly tubular form - somehow they've taken on the appearance of knotty tree branches (they should fit right in with the Etsy trend of faux bois then, ho ho ho!) and will need some steaming to straighten them out. The front has been embroidered with red wool flowers and the reverse still shows some of the green yarn guidelines knitted into the swatch. The purse is lined with a muted green polyester satin print and closes with a snap fastener. I'm not sure what to do with it now. I think it's quite cute but since I'm closing my Dawanda shop at the end of the month I won't have a dedicated venue for all things fibrelicious unless I mix it in a bit! Maybe I should start pushing my ecrater store as ebbandfibre?